Japan’s National Seven Universities. Numerous prominent scientists have worked at Osaka University such as the Nobel Laureate in Physics Hideki Yukawa. It is the 4th best ranked higher education institution in Japan (96th worldwide) in 2016 by the Academic Ranking of World Universities. medicine, is widely believed to be based on Tekijuku. Medical College with university status by the University Ordinance in 1919. The college merged with the newly founded College of Science to form Osaka Imperial University in 1931. Engineering two years later. 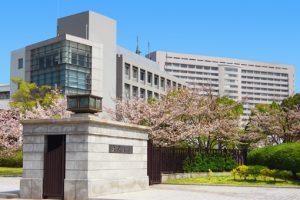 The university was eventually renamed Osaka University in 1947.
disciplinary and cross-institutional Osaka School of International Public Policy, add to the list, making the number of graduate schools reach 12 in 1994.
integrate the scattered facilities into the Suita and Toyonaka campuses. In October 2007, a merger between Osaka University and Osaka University of Foreign Studies was completed. merger made the university the largest national university in the country. seminars, and other events open to staff, students and, often, the general public.